As a child, I loved to go fishing with my Dad. He had friends who owned a small, creek-fed pond so once or twice a month, we would head out to that pond and toss our lines in the water. I can still remember how as a child, the ditch that we had to cross to get to the pond seemed huge, how the Weeping Willow tree that grew on the back side of the water seemed like it reached to the Heavens and how that snapping turtle I caught once, seemed as if it were big enough that it should live in the ocean. Of course, I was little – only around 8 years old – the last time we fished that pond so size was relevant, but the memories aren’t. Now, as an adult, I not only still enjoy fishing, but I see it as another way to provide for my family in a way that won’t break my bank account. 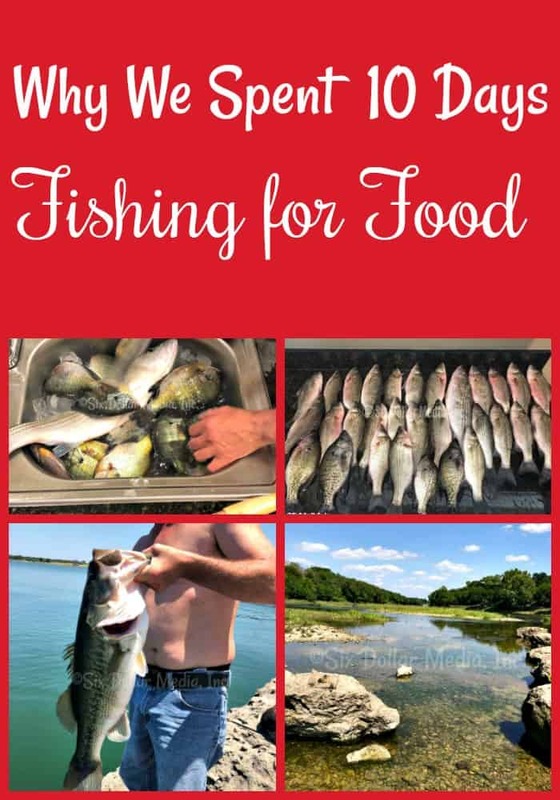 Fishing for food can not only be an effective tool in your ways to save money on groceries, but also to brush up on a skill that you may have once had but lost (as was the case with me) and a way to spend time with your loved ones without spending a ton of money to do so. I wish I could say that Dad and I spent years fishing together but the truth is that we stopped going around the time that I turned nine. I’m not exactly certain why, but honestly as I grew into my teenage years, I wouldn’t have been likely to go with him anyhow. I wasn’t exactly the fishing type as a teen so needless to say, when Steve and I started fishing again not too long ago, it had been roughly 28 years since I had even picked up a fishing pole. Since we were fishing for food, I needed to be able to pick the skill back up and quickly. Luckily, it didn’t take as long as we thought and pretty soon, we were both reeling in catches that would fill our freezer. The question did come about though as to whether we were actually saving money on groceries or if we were simply fooling ourselves into thinking that we were getting a better deal by fishing for food ourselves. There was no doubt that what we were pulling out of the lake was healthier than what was at the store and there wasn’t much doubt that it tasted better, but cost wise; we wanted to know. So I did what I am good at. I figured our the exact cost per meal and per person of our fishing trips compared to the cost of buying the meat in the store. Very quickly it became crystal clear that yes, we were indeed saving money and were feeding our family fresh, nutritious fish at the same time. Frankly, in my mind, you can’t beat getting to save money and eat fresher food together. As you can see, we do tend to have really good luck fishing together. Steve and I are each other’s best fishing buddies and yes, I do think that makes a difference. We work together to bring in the fish that we do. The photo above shows our family catches for a single fishing trip. 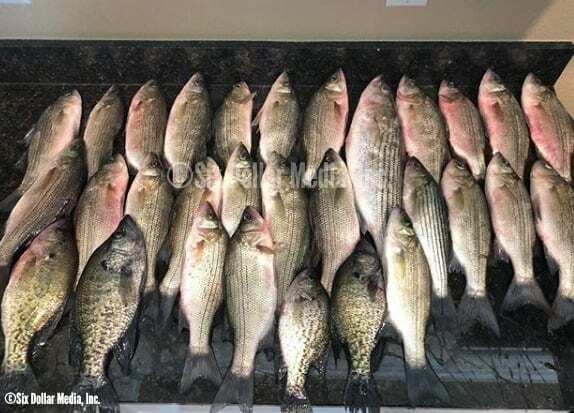 It includes striped bass, white bass and crappie that we brought home and filleted. This single fishing trip accounted for 5 or so of the 22 meals that we were able to get out of our 10 day excursion into fishing for food. 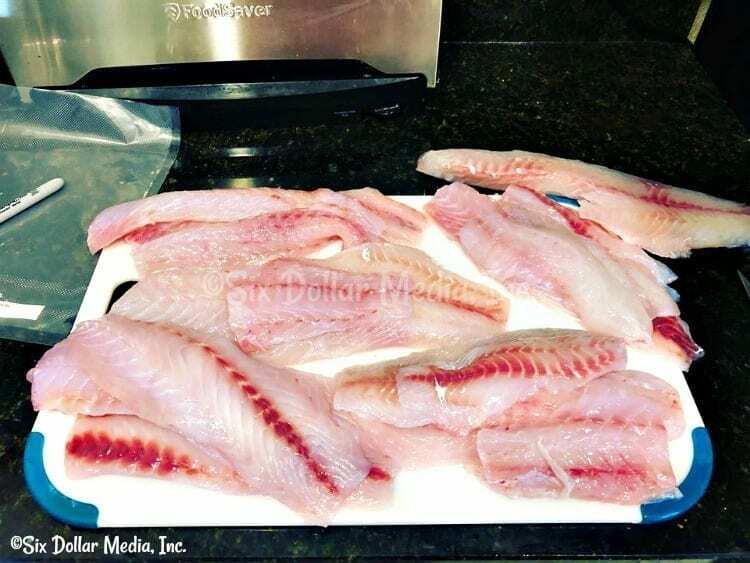 To do this comparison, I watched the sale ads at my local grocery stores for 3 weeks and used the average prices of catfish and tilapia for those weeks to find the average price for the grocery store prices. It came out to an average of $4.99 per pound. 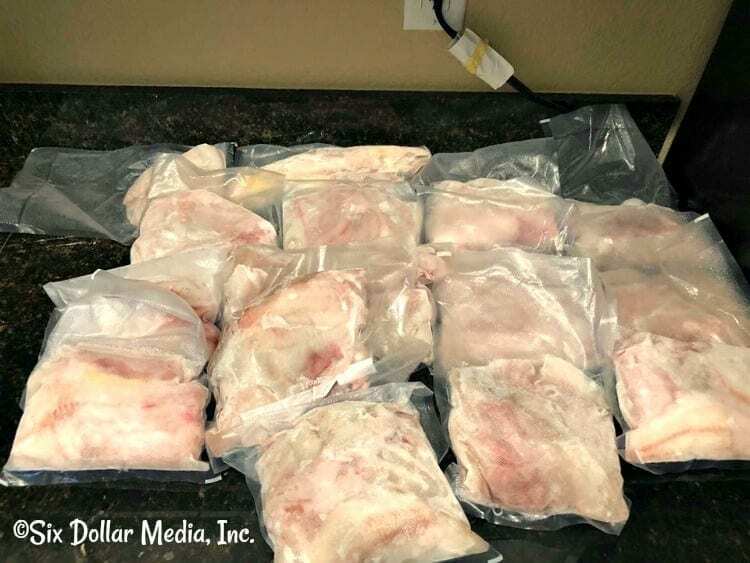 Each of the meals that we vacuum, sealed in the Foodsaver we use were approximately 3 lbs each on average. The in-store cost for these meals would have been roughly $15.00 per meal or $3.75 per person. Our cost was significantly less per meal even after paying for bait and gas. Now I know you’re looking at the cost breakdown and wondering why the 9″ fillet knife says $0.00. 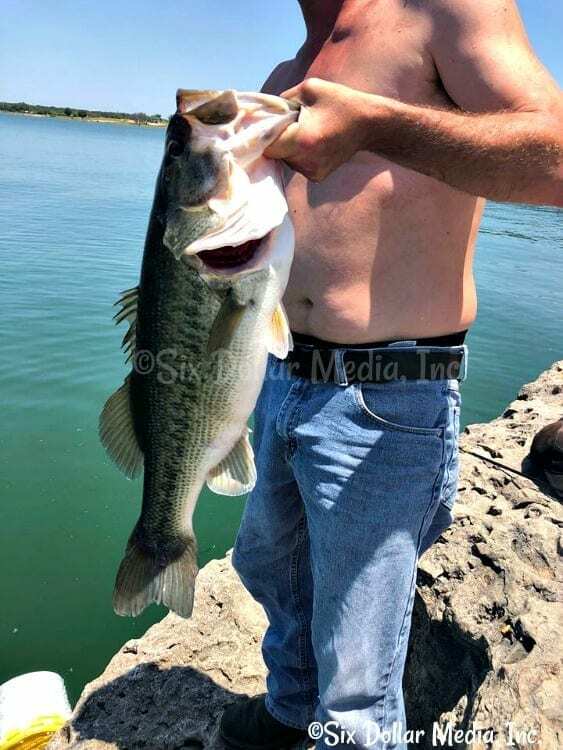 We already owned the 6″ fillet knife, but as you can see by the large-mouth bass photo, we needed a larger one due to catching a few larger fish. The answer is that I got the knife free from Amazon because I had taken the time to earn free Amazon gift cards. There are a few more pieces of fishing equipment that we still need to pick up – such as a keep net since we often fill our fish basket very quickly and minnow traps so we can trap our own bait and cut out costs even more – and I will use free Amazon gift cards to “purchase” those items for free as well. Purchasing our items this way ensures that our costs stay low and that we are able to lower them even more for even more savings. 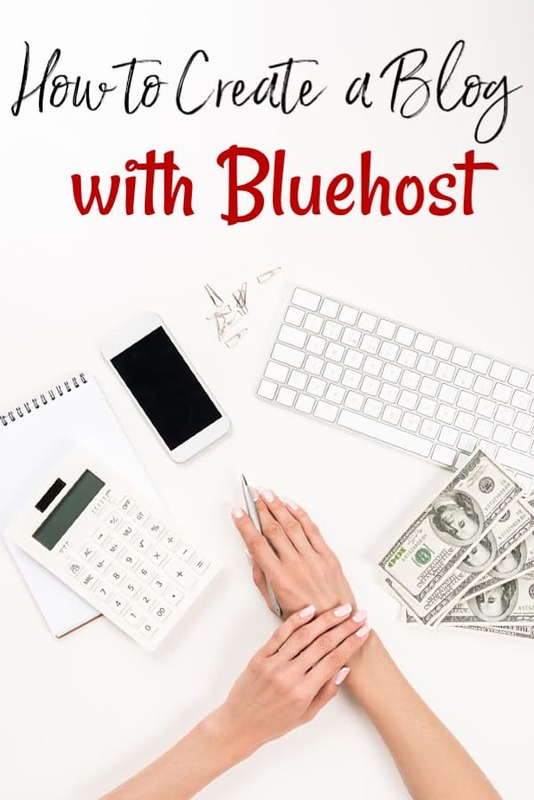 If you are interested in learning how to earn free gift cards, THESE 39 sites to earn free gift cards online from are the best place to start. Fishing for food is one of those things that you really do have to love in order to do. Most of the time, you aren’t going to be able to throw your line out and catch enough to feed your family in one trip. Steve and I have been extremely lucky in that we have landed right on top of an amazing spot to catch and that we catch where others don’t because of how we fish the water. If, however, you have the patience and you have the love for throwing your lines in the water, it can be an incredibly effective way to save money on groceries. Living a frugal life doesn’t have to be something that makes you miserable. If you love something and it saves you money; by all means, do it! May your lines be tight and your friends be good. Looking for more ways to save money on groceries? Check out these 16 ways to save money on groceries that no one talks about HERE.